In The Paying Guests, Sarah Waters continues her tradition of weaving a story filled with tension. Waters is known for novels that combine historical elements with plot-driven storylines often fueled by romance. Her first book, Tipping the Velvet, became a BBC miniseries and won the Betty Trask Award. Affinity, her second novel, won the Somerset Maugham Award and the Sunday Times Young Writer of the Year Award. Her third novel, Fingersmith, won the South Bank Show Award for Literature. Other novels she has written have been shortlisted for the Mail on Sunday / John Llewellyn Rhys Prize, the Man Booker Prize, and the Orange Prize. 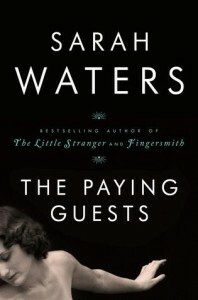 The Paying Guests is captivating—it’s nearly six-hundred pages packed with drama. It’s London in the early 1920s and Frances Wray, a woman in her late twenties, lives with her mother in a house empty of men—two brothers lost to the war, a father to a stroke. Like others in their city, they are suffering financially. They’ve given up luxuries, no longer keep house staff, and limit their use of gas lighting. To ease money problems, they open their second floor to renters, called paying guests. Frances and her mother hope their lives won’t have to adjust much to accomodate these boarders but when a young married couple, Len and Lilian Barber, move in, their lives begin to shift. The Wray family pushes forward, haunted by the loss of three family members. Mrs. Wray is embarrassed by the Barber’s middle class status, by the way they decorate their rooms, play loud music, and laugh with each other. Frances is embarrassed by Len’s innuendos when he chats her up in the kitchen. Frances, not yet thirty, is viewed as a spinster by the community. She acts as housekeeper, cook, and landlord; she offers herself as a sacrifice to her mother, who is aging and easily embarrassed by the sight of her daughter washing the floor. Frances and Lilian, both home alone much of the day, find themselves in a kind of friendship, and Frances begins to fall in love with Lilian. Frances has fallen in love before, with a woman now living in the city. Although they planned to start a life together, the death of Frances’ brothers and fathers caused her to choose to stay with her mother and give up the kind of life she’d wanted. One of the strengths of this book is the slow bloom of romance. Waters knows how to make a page thrum with potential. Will they or won’t they? But this is not a typical lesbian romance—as with her other novels, Waters surrounds the developing love story with intrigue and mystery. The delight of this book is captured in the moments between Frances and Lilian. From a discreet meeting of hands on the stairs to the afternoon affairs while Len and Mrs. Wray are out, every meeting between these two is charged with possibility, emotion, and danger. In the first third of the book, the thrill is in the relationship that develops between Frances and Lilian. With subtlety, Waters describes their smallest intimacies, building a case for the burgeoning love story to follow and creating tension that lets the reader into this potential romance. As in her previous novels, the love story is the heart of the novel, but it’s also the catalyst for the way these two lives will change. These characters are challenged by love, dared to make choices that will change them forever. This isn’t a simple story about the risk of love, however. A tragic incident forces these two characters into a situation that requires them to investigate their own morals and bravery in the face of love. This is a love story and a crime story, all at once, and Sarah Waters continues her history of thrilling readers with a story line that moves like a well choreographed snake in the grass, and characters so vulnerable and real it’s hard not to fall in love with them yourself. Katie McClendon is a third-year fiction writer in Purdue University’s MFA Program. She has worked with Bent Writing Institute and Richard Hugo House as a creative writing teacher and workshop instructor. Although she identifies as a fiction writer, her poems have appeared in Ante Review, Mare Nostrum and Portland Review. She is currently working on her first short story collection.